Millennials were also fairly directed in their viewing habits, with 34% of them saying that they are most likely to go to a specific show on a streaming service when they sit down to watch TV. The report also said that attitudinally, millennials were big fans of quality programming and see streaming services as the producers of the best shows “on TV” - an indication of how SVOD services’ massive investments in original content appear to be paying off. 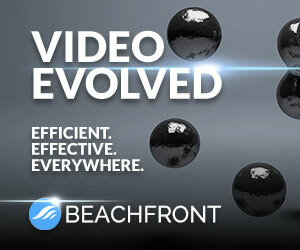 As shown below, 60% of overall cord-nevers also stream video, with a median age of 31 years-old. 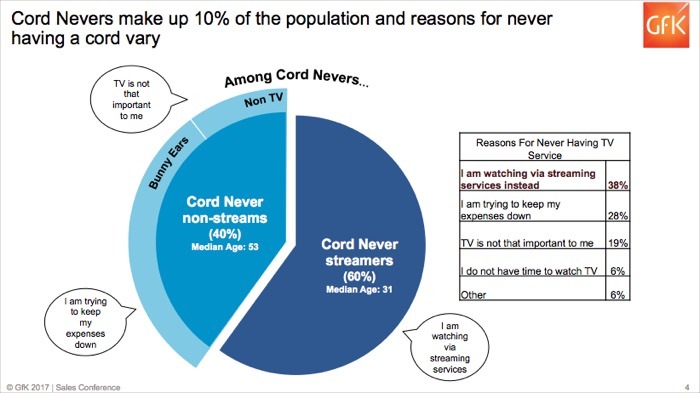 The number one reason among all cord-nevers for not having pay-TV service is “I am watching streaming services instead” cited by 38%, of respondents, with “I am trying to keep my expenses down” cited by 28%. Nobody should be surprised by the shifting behaviors of millennials away from expensive pay-TV bundles and toward cheaper, more flexible online options. A perfect example of the impact of millennials’ changing viewership was detailed in a WSJ story about A+E Networks just yesterday. Citing Nielsen data, the WSJ said that primetime viewing for A+E and History Channel among 18-49 year-olds dropped by half from 2013 to 2016, though both have rebounded a bit recently. No doubt a big share of that viewing has moved online. The double whammy for the TV industry is that even as millennials’ interest in pay-TV and linear TV viewing has shrunk, so too has their tolerance for advertising. Last week eMarketer predicted that 43% of millennials are now ad-blocking online, an indication of how expectations are being re-shaped by ad-free SVOD experiences. No doubt we’ll see further cord-nevering and cord-cutting research as the year progresses, showing the trend deepening among millennials.